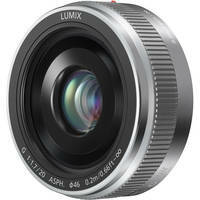 Buy New Panasonic 20mm f/1.7 ASPH LUMIX G Lens Malaysia At FotoZZoom! The LUMIX G 20 mm / F1.7 ASPH features a dramatic compactness and light weight despite its F1.7 brightness allowing a beautiful soft focus for photos to be even more impressive. Comprising of seven lenses in five groups, the new lens system uses two aspherical lenses most effectively to minimize both distortion and chromatic aberrations, achieving super high resolution corner to corner. The versatile 20 mm of focal distance (Equivalent to 40 mm on a 35 mm film camera) is suitable for wide variety of occasions from daily snapshots including scenery like sunsets and dimly lit indoor shots to the deliberately creative shots taking advantage of its beautiful soft focus. When mounted on the LUMIX G Micro System Cameras, the LUMIX G 20 mm / F1.7 ASPH allows use of the advanced contrast AF system, which includes a Face Recognition function, for more convenient, more enjoyable shooting. Seven blades give the aperture a rounded shape that produces an attractively smooth effect in out-of-focus areas when shooting at larger aperture settings. The LUMIX G 20 mm / F1.7 ASPH lens also features a highly reliable metal mount, and uses multi-coated lens elements that minimize ghosts and flare to further enhance its optical performance. Continuous AF does not work for still image recording. The LUMIX G 20mm / F1.7 ASPH. utilizes a lens drive system to realize a compact and bright F1.7 lens. As a result, sound and vibration may occur during focus operation, but this is not a malfunction. Operating sounds will be recorded when auto focus is performed during motion image recording. It is recommended to record with Continuous AF set to OFF, if the sound of operation bothers you. Also, it is not possible to set the focus mode to AFC.